Splendid Yachting charter company is established in 2014, and since then it’s continuously growing. This Swiss/Croatian yacht charter team invests a lot of effort in offering top-quality arrangements and adding extra value to each guest. For us, MMK is the most complete booking system. Because of the always extending world-wide agency network, the various functions besides the classical booking tool, the fantastic support and the continuous seminars this booking tool is No.1 for us. Splendid Yachting charter company is actively present on Croatian Yacht Charter market from season 2015 since they started to offer carefully designed services. This Swiss/Croatian team of yacht charter enthusiasts began with 4 motor yachts and within the last 4 years they’ve extended fleet and professional staff at the charter base dramatically. Splendid Yachting varied fleet is consisting of nine very well-tended motor yachts from 44 ft to 72 ft of international premium shipyards. Headquarters are situated in Zurich and their yachts can be booked from D-Marin Mandalina, Šibenik, which is excellently accessible and with the annexed hotel resort. Also, it has won the prize for the best mid-sized marina in Croatia, and for sure is one of the most beautiful in Croatia. Over 15 years of experience in the yachting industry which includes a job of a professional fleet operator gained Splendid Yachting team valuable knowledge of clients' needs and requirements. From the first day, they pay special attention to permanent yacht maintenance and perfect preparation in a charter base. Splendid Yachting permanent “menu” includes carefully created arrangements. The main thing about their yacht charter work is all-around service for the best time of the year. Beginning with the right yacht, to all the right amenities, the smooth organization and the continuous availability just in case. Great effort invested in yachts maintenance, cleanliness and extra services is “guiding light” for making a unique experience for every client. The team takes care that charter yachts are always in top condition and also carefully plans charters. They’re always available to give you suggestions for fantastic trips or solve any unexpected problem. With mutual trust and good organization, it is possible that even bigger yachts are chartered without a skipper. If client is initially somewhat uncertain in dealing with desired yacht, Splendid Yachting team will be very happy to help them refresh their steering skills in a casual setting, so that they can safely sail and enjoy the sea with a dream yacht. Being a part of Azimut Yachts dealership network guarantees them a continuous injection of joining new and attractive Azimut Motoryachts into the fleet. 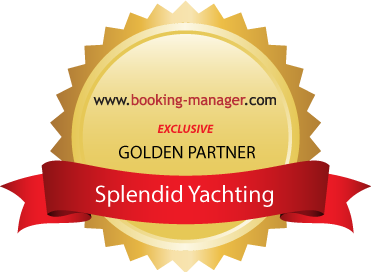 Exclusive use of Booking Manager for their administrative processes gives Splendid Yachting Golden Partner status which gets them great business benefits. The System empowers them to easily manage fleet and streamline overall financial process with efficient billing tools and advanced financial reporting. Booking Manager real-time platform enables Splendid Yachting visibility to more than 2800 agencies. With use of advanced tools like Revenue Planning, they are able to make precise pricing strategies, attract the attention of new customers and empower communication with the existing. Crew List tool enables Splendid team to easily collect information about each crew member and automatically create a tourist tax invoice at the check-in time. Also, the advanced Crew List feature directly connects Croatian charter companies with the "E-crew" system and allows them to easily send online crew list form link directly to clients and make an export from the Booking Manager.